Prime Minister Justin Trudeau is warning that some politicians will try to sow division and fear among voters to win the federal election slated for this fall. "And that's why, as a party in 2015 and again in 2019, we are going to pick the other path -- given people's worries and anxieties -- which is allaying those fears," Trudeau told supporters at a fundraising event Monday in Charlottetown. 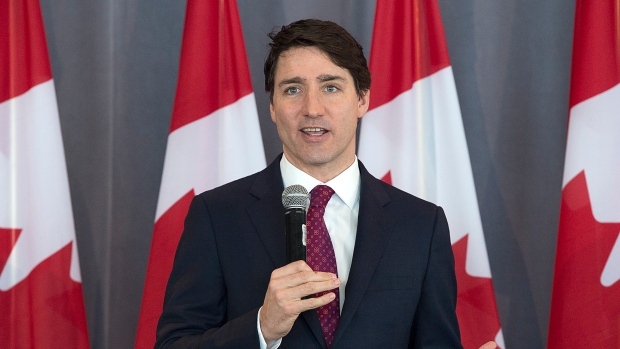 The prime minister also said his government is planning for the future of work in Canada by investing heavily in artificial intelligence and robotics. "We're going to make sure we're investing in skills, in jobs, in training, in education, in research right across the country so that Canadians can be empowered by the changes we're going through." Trudeau and Veterans Affairs Minister Lawrence MacAulay later met with P.E.I. Premier Wade MacLauchlan. Heading into the meeting, MacLauchlan noted the announcement last week by the Conference Board of Canada that P.E.I. is expected to lead the country with 3.2 per cent growth this year. Later in the day, the prime minister announced his Liberal government will spend $37.5 million to help a pharmaceutical company expand in Atlantic Canada. Trudeau made the announcement at BioVectra Inc. in Charlottetown, which plans to spend $144 million over five years to expand its operations in Charlottetown and Windsor, N.S. Trudeau issued a statement saying BioVectra is a leader in producing life-saving treatments for serious illnesses that affect millions of people around the world. The project is expected to create 150 full-time jobs over five years in P.E.I. and Nova Scotia. BioVectra President Oliver Technow said the company has spent $25 million per year since 2015 to expand the business. The company's clients include most of the world's top 20 biopharmaceutical companies, he said in a statement.